In Part 1 we looked at QOS level 0 and 1. In the second part we look at QOS level 2. This level guarantees that the message will be delivered only once. This is the slowest method as it requires 4 messages. 3. 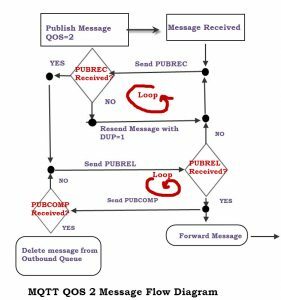 If the sender doesn’t receive an acknowledgement ( PUBREC) it will resend the message with the DUP flag set. 4. When the sender receives an acknowledgement message PUBREC it then sends a message release message (PUBREL). 5. When the receiver receives the PUBREL message it can now forward the message onto any subscribers. 6. The receiver then send a publish complete (PUBCOMP) . 7. If the sender doesn’t receive the PUBCOMP message it will resend the PUBREL message. 8. 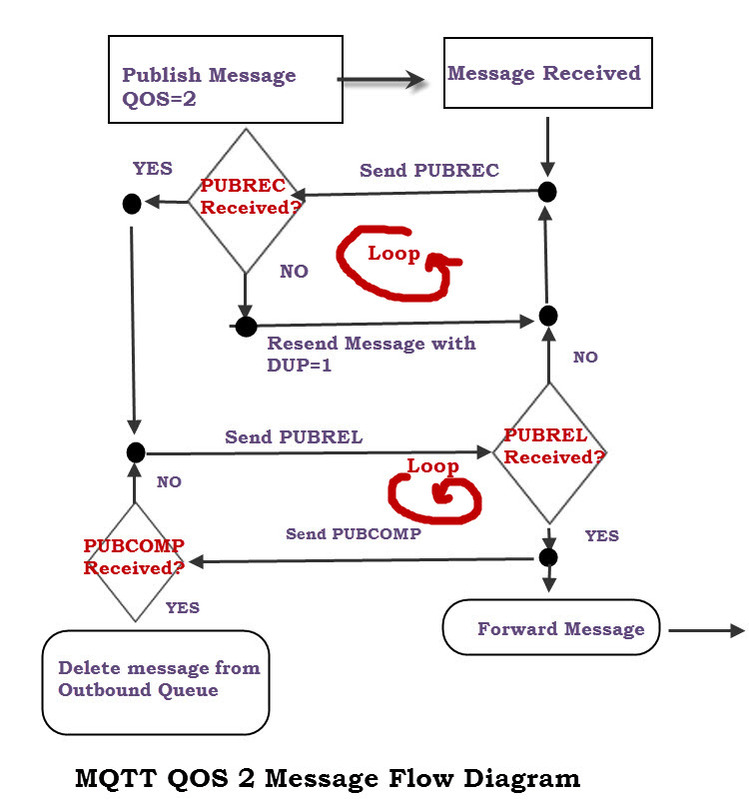 When the sender receives the PUBCOMP the process is complete and it can delete the message from the outbound queue. For this example I have created a Python script to publish messages with a QOS of 2. I have also hacked the Python Client Class so that I can suppress reception of the PUBREC and PUBCOMP messages to simulate a network failure. To start we do a simple publish with QOS=2 and observe the PUBREC,PUBREL and PUBCOMP messages under normal conditions. We also observe the message being marked as delivered, and removed from the outbound message queue. Then we simulate a network problem by blocking the PUBREC message. Now you should notice that the message remains stuck in the outbound message queue. Now we send two more messages this time a QOS 0 message, and a QOS2 message. Notice that the QOS 2 message gets stuck in the outbound queue as it is waiting the acknowledgement handshake. Now we disconnect and reconnect to demonstrate that the client still remembers the messages, and it tries again to re-send the message with the DUP flag set. If you examine the monitor output you can see that no duplicate messages have been received. The Quality of service between two clients connected to a broker is determined by the QOS of the published message,and the QOS of the subscribing client. When a client subscribes to a broker with a QOS it is effectively instructing the broker to publish messages to it, with that QOS. “5. 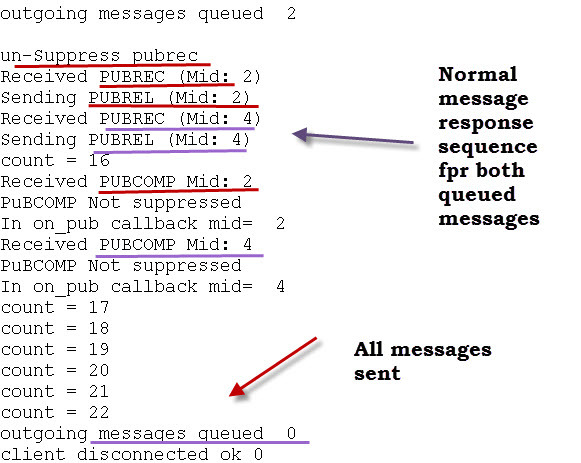 If the >>RECEIVER<< doesn’t receive the PUBREL it will resend the PUBREC message [to the sender]". Yes you’re correct I’ve edited it. Thank you for the amazing content. I have one question though. I read somewhere that the QoS that the sender specifies for a message is also enforced in the channel from the broker to the subscribed clients, is that true? Could you elaborate on the relation between the QoS of a message and the QoS of a subscription please, I am unable to find information on the matter. As far as I understand the QOS is from client to server or sever to client. It is not from client to server to client. I.e it applies to a link. A link being client to server or sever to client. The delivery protocol is concerned solely with the delivery of an application message from a single Sender to a single Receiver. When the Server is delivering an Application Message to more than one Client, each Client is treated independently. The QoS level used to deliver an Application Message outbound to the Client could differ from that of the inbound Application Message. The library I use is the pubSubclient library. The details of this library are given at https://pubsubclient.knolleary.net/api.html. When subscribing to the MQTT link, I first enter the broadcast information that will be subscribed with “boolean connect (clientID, username, password, willTopic, willQoS, willRetain, willMessage)”. Then I use the “publish (topic, payload)” code when posting this post. When doing these settings, the QoS level is 2. I follow these messages with the MQTT.fx program. Messages in the MQTT.fx program have a QoS level of 0. I could not make the Qos adjustment 2 anyway. I looked at the code page and there s no provision for publishing with a QOS of 1 or 2. The will QOS is different than a normal publish. good day. I want to integrate the ESP8266 or run it in the mqtt protocol. For this I use the pubSubclient library. I realize the connection mqtt. I send and receive messages via mqtt protocol. But the quality of these messages is QoS 0.
mqttqos as the integer value in the code I am setting 2. but still sending in sending quality QoS 0. What should I do to send my messages in QoS 2 quality? Can you point me to the details of he MQTT client library you are using? How are you viewing the QOS of the message being published? If it is through the received message then you also need to be subscribed with a QOS of 2.